If you haven’t checked out this piece at MacEwan yet, you need to. Brenda Draney’s “Trapline” isn’t just a single work of art. It’s three. 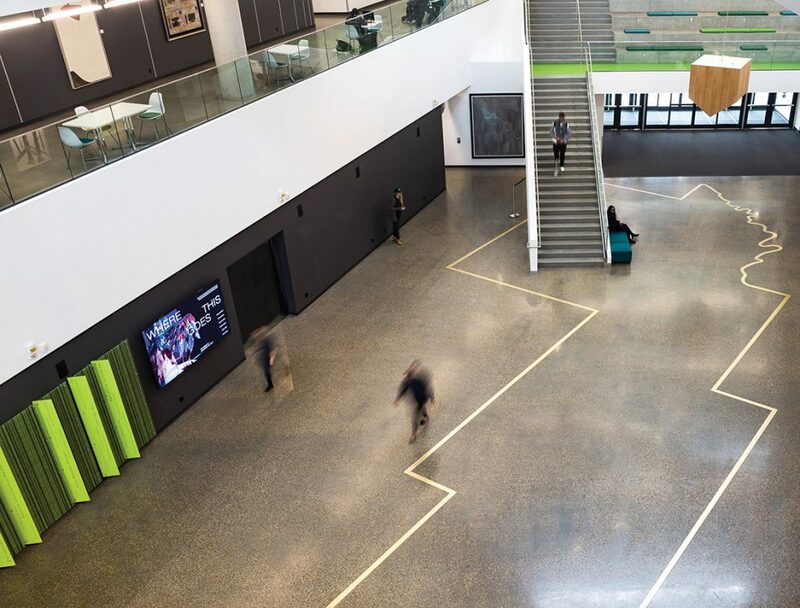 The installation, which was unveiled in the atrium of MacEwan University’s recently-opened Allard Hall in October, features a tracing of bronze embedded into the main floor. The shape was inspired by a trapline near Slave Lake that was set by the father of Draney’s brother-in-law. The bronze line was tested, to make sure it wouldn’t be a hazard to any walkers or visitors with mobility issues. The edges aren’t sharp, so there’s no place to catch a toe or a heel, or a barrier that it would be tough for a wheelchair to get over. On one wall is a series of paintings that reflect the wilderness and seasons near the trapline. And, hung suspended from the ceiling over the atrium, is a large wooden shape that resembles an upside-down cabin. It is a piece that comes at you not only in three parts, but also in three dimensions. If you’re on the main floor of Allard Hall, the bronze trapline that’s secured to the floor feels like something you can follow along on foot. But, head up the stairs, go up a floor or two, look down and the shape of the trapline becomes evident. The perspective of the hanging cabin changes depending on if you’re looking at it above or below. And, the art on the wall adds yet another element for the viewer. The process took three years from concept to finished piece. Draney praised the work of Ruth Burns, the former director of Nuit Blanche Edmonton, who acted as the project manager for “Trapline.” They met three years ago, just as Draney was putting together her proposal. “One of the gratifying aspects of this project is the support that comes to bear, all the support that you learn that you have,” said Draney.